Visoke Volcano is located on the Democratic Republic of Congo / Rwanda border. The volcano contains a 450-m-wide lake in the summit crater. An eruption in 1957 formed two small cones on the north flank, 11 km from the summit. A field of cinder cones is located between Visoke and Sabinyo volcanoes. lavas. Visoke leucitites exhibit a relatively restricted compositional range. 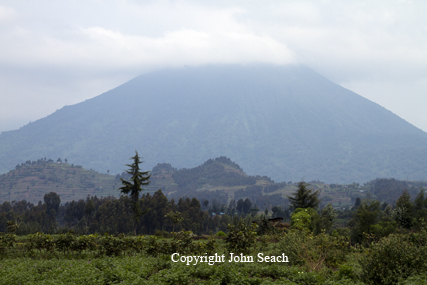 In 1957 an eruption occurred at Mugogo volcano, 11 km north of the summit. Volcanoes of Democratic Republic of Congo.